A unique all-natural blend of pure Resveratrol, Powergrape® red wine grape extract from Bordeaux, plus Quercetin. Designed to promote health and longevity. In the sun-drenched hills of Bordeaux, France, the red wine grapes produce hundreds of antioxidant polyphenols including Resveratrol and Quercetin, to protect themselves from heat, cold, fungus, and disease. Scientists have discovered that eating grapes and drinking wine containing these potent compounds may benefit our health too. Now Vinomis Laboratories brings you the Resveratrol -equivalent of over 100 bottles of red wine (without the alcohol or its calories) in each Vindure™ 900 tablet. For over two hundred years, scientists have known that red wine provides significant health benefits. In 2003, a team of scientists at Harvard Medical School discovered that Resveratrol, Quercetin, and other polyphenols found in red wine activate the SIRT genes. These genes produce the sirtuin enzymes which can help slow the aging process. Reseveratrol - equivalent of over 100 bottles of red wine in each tablet without the alcohol or calories. 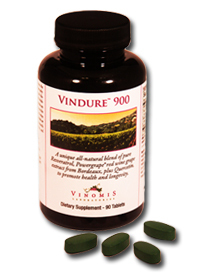 One daily Vindure®900 tablet provides nearly 4 times the USDA antioxidant recommendation. • 2007 French Agronomic Institute study showed that 400mg of Bordeaux grape extract resulted in a 21% improvement in athletic performance, reduced inflammation by 48% and reduced cellular damage and cramp risk from exercise significantly. • 2007 study by Dr. Smoliga at Marywood University showed that the combination of grape polyphenols, Resveratrol and Quercetin found in Vindure™ improved neurocognitive performance and improved memory. • In 2007 researchers at Appalachian State University found that 1000mg of Quercetin daily can improve upper respiratory immunity and help maintain performance in physically stressed test subjects. ** As a result, some US soldiers are now being supplemented with Quercetin. • In 2004, scientists at the University of Montpellier in France used healthy animals to demonstrate that Quercetin reduced blood sugar and decreased appetite. • In 2003, Drs. Baur and Sinclair of Harvard University discovered that Resveratrol increased the lifespan of organisms and animal species by 20-40%. Their research concluded that the subject animals lived longer and healthier than the control animals. The most striking results were in the protection of the heart and blood sugar control in laboratory mice. • At the University of Michigan, animals that received grape extract had improved blood pressure, heart function, reduced oxidative stress and healthier heart muscle. • FDA registered over-the-counter drug and supplement manufacturing facility. • Plant certified for pharmaceuticals by the Australian TGA. • USP & NSF good manufacturing practices certified plant. • Vindure™ contains no animal products, and no allergens. • Ingredients are high purity and the best quality available. 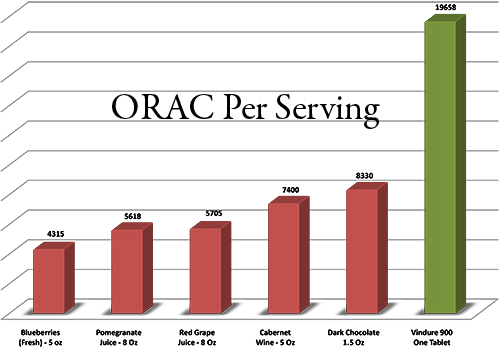 Many Resveratrol products are less than 50% pure, compared to Vindure at over 98%. • Trans-Resveratrol - 400mg, Resveratrol has been shown to be the grape's primary activator of the SIRT genes which prevent aging. Research on Resveratrol has shown health and longevity benefits in animals and many health benefits to humans. 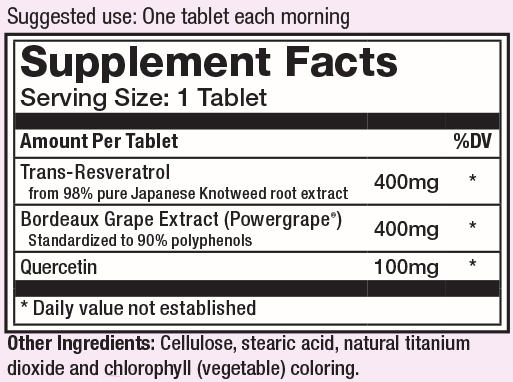 Our Resveratrol comes from Japanese Knotweed (polygonum cuspidatum) root extract purified to at least 98%. • Powergrape® red wine grape extract from Bordeaux - 400 mg. 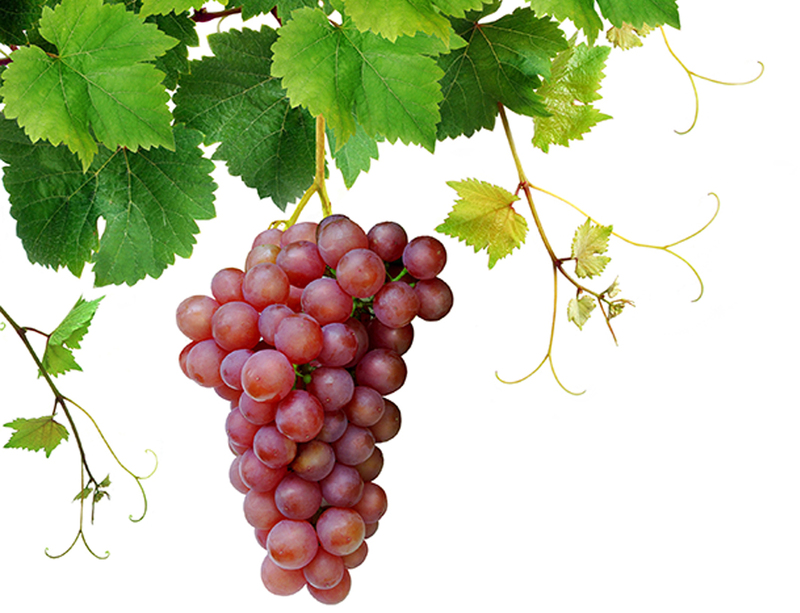 These grapes contain very high concentrations of antioxidant polyphenols, including Resveratrol. • Quercetin - 100 mg. In addition to increasing the bio-availability of Resveratrol. Quercetin is the #2 bioactivator of SIRT genes, after Resveratrol, and has been shown to have beneficial health properties on its own. It has also been shown to have respiratory health benefits. • Easy-to-swallow coated caplet, safety sealed in a light and moisture resistant bottle. How long will it take before I feel the benefits of Vindure™? Many customers report increased energy and mental sharpness, and a general feeling of vitality in one to two weeks. Of course, the greatest benefits of Vindure™ will be experienced over the course of a lifetime. When should I take Vindure™? Should I take it with food? Vindure™ is best taken in the morning so that any energy increase will not interfere with your sleep. It is absorbed best on an empty stomach, but feel free to take it with food if that works best for you. Are there any interactions with other medications? As a prudent precaution, please consult with your doctor if you are taking any prescription medications, especially systemic anticoagulants or chemotherapy. There is a bewildering array of products containing Resveratrol. Why Vindure™? 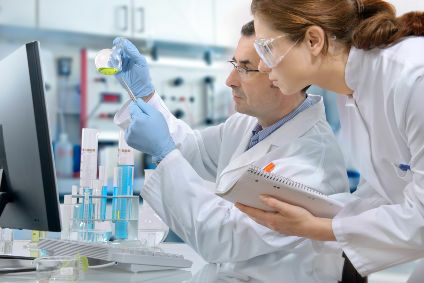 Vindure™ provides the best value product on the market, based on purity, dosage, and quality, backed by scientific testing and human clinical trials. Why is Vindure™ a tablet instead of a capsule? Vindure™ is produced in specially designed coated caplets. This form allows us to pack the maximum amount of active ingredients in the smallest possible size. Our caplet is coated with an easy-to-swallow coating which protects the active ingredients from light and moisture. The caplet is designed to achieve the ideal rate of breakdown and absorption in the digestive tract, superior to that of a capsule, liquid, or uncoated tablet. In addition, Vindure™ is micro-granulated to maximize absorption and bioavailability. The packaging is also designed to provide additional protection from moisture and light exposure, which can reduce potency. Based on all the research to date, the Vinomis board of medical advisors has specified the current amounts of Resveratrol, Quercetin, and red wine grape extract in Vindure™ 900 to maximize the benefits. One tablet per day is the recommended dosage for adults. We do not recommend Vindure for thouse under 18. If you are pregnant or nursing, please consult with your doctor before taking any supplements. All purchases are covered by our 60-day 100% Unconditional Money Back Satisfaction Guarantee so you are completely protected. Vindure™ is a terrific value, too. No other food or supplement provides longevity gene activation along with an antioxidant powerhouse for only about a dollar a day. And every bottle of Vindure™ comes with our no-hassle money-back guarantee. If, for any reason, you feel Vindure™ has not met your expectations or has not provided complete satisfaction and excellent value, return the unused portion or empty bottles. Please call customer service (1-877-484-6664) for a return authorization number and return instructions. We will process your return and refund your money as quickly as possible.